A Scattering Of Petals … – Petals ~ vignettes . Petals may scatter, but the memories remain ..
Petals ~ vignettes . Petals may scatter, but the memories remain ..
A Scattering Of Petals ~ an eclectic collection of things academic and profound, nonsensical and frivolous, of vignettes integral to one’s being ~ literature, poetry, art music, dance . The petals may scatter, but the memories remain . Of Things Academic and Profound : The Tale Of Three Physicians , The Panchatantra ~ The Legacy Of A King’s Son , The Time Quintet ~ A Child’s Guide To Quantum Physics ~ and witches Which, Whatsit and Who . Madeleine L’Engle . Graphics AE . Apps : Juxtaposer, Word Swag . The beginning of a dream… Several years ago I began a chaotic – and as yet incomplete journey – to start a Word Press site .Interruptions, disruptions. The intention to write an impressive, thought provoking , diverse collection of great importance has shrunken to a mere few articles . But from the disappointment and frustration something surprising emerged – the beginning of a dream . Even if your Word Press site is profoundly profound it requires an adjunct – something that will immediately attract interest and entice the reader to travel further. And that of course is the illustrative material. The internet offers a generous , endless selection of material . But I wanted something different . Something not only original , but something specific to what I was writing, something that was integral to the subject and visually arresting . So began a discovery, a journey completely unexpected . Graphic design was once the unassailable and expensive territotory of the graphic designer . But as the internet continued its relentless onward progression a rapidly increasing collection of graphic apps began Simple apps that would allow the proud parent a showground for the photos of their offspring . And increasingly complex apps – again the territory of the trained graphic artist . I was intruiged . And I needed and wanted good graphics for my posts . So began months of experimentation . A solitary journey replete with splotches and blotches . And brain wracking encounters with technical data about which I knew nothing . But I kept trying . I have always had a creative streak, but with the demands of family and work – the whirlpool that engulfs most of us – creativity mainly found expression in the garden . This was completely new , unexplored territory . And slowly, increment by time consuming increment I found something quite unexpected happening . On my trusty workhorse of an old iPad and a humble stylus – and stretching a few brain cells – interesting colourful splotch free images began to emerge .And instead of a catastrophic mess that had to be immediately deleted , there were surprisingly creative images . All of which further impelled my desire to explore and experiment . I began the whole experiment using the simplest of apps and techniques . Ideas came flooding in . I learned by time consuming degrees to accept those ideas beyond my capabilities . And rejoiced when things suceeded far beyond my expectations . Finally I felt brave enough to create the image I have used here as a header . For the final indignity inflicted on the unsuspecting eagle , more alien effects were created . This time a threatening, unfriendly planet . And I was pleased with the final result . The image was well balanced and imaginative . If affirmed for me that I could competently create the images needed for my Word Press site . But the most exciting thing was the discovery of a creative ability , a skill I had no previous awareness of . Something I will delight in exploring.. the beginning of a dream . ❄️ I have described at length here the journey taken . And the way in which the images were created . Very much hope this will encourage someone like me – unsure of what they can achieve . Begin with something simple . The apps that allow you to erase background and overlay images are a good starting point . And don’t be disappointed at initial results . It took me several months and a lot of hard work before I was happy with the results . Many apps are user friendly . Make full use of online tutorials . And if an app is too difficult to navigate or cluttered with ads , don’t waste your time – there are plenty of apps to choose from . And, if , as above , you have a time consuming workload , the graphic art is something that can be done at short intervals. In fact it is wonderfully relaxing – a great way of taking time out . Finally enjoy yourself ! Maybe you don’t have the necessary skills, but there is always something else to explore . And, if like me , you find an unexpected ability, have a wonderful and exciting journey ! Nonsense necessary in a nonsensensical world . Nonsense is necessary in an increasingly nonsensical world . ” A little nonsense now and then is cherished by the wisest men ” said Roald Dahl . To which Dr. Seuss added” I like nonsense … It’s more than a matter of just laughing . If you can see things are out of whack, you can see how things can be back in whack .” Nonsense is a double edged sword . It is not just a matter of hysterical laughter . It is a finely honed balance of recognising the levity and nonsensical nature of whatever it is – and at the same time acknowledging reality and acting on that awareness . Valley Of the Ants ~ Miniscule. 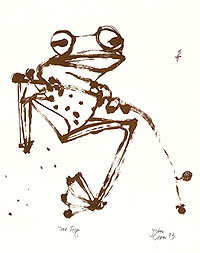 And the Australian artist John Olsen’ paintings of the frog . 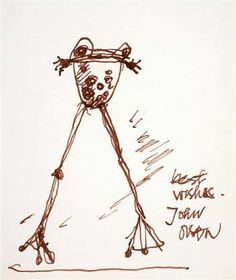 ” The frog is a key motif … The artist is attracted to the theatre of the frog, their flamboyance… the big eyes.. elongated legs .” John Olsen Art Series . The ant and the frog . Nonsense in its simplest form – just nonsense for the sake of nonsense, Nonsense though has, as above , a further purpose . As in work of another Australian artist . Michael Leunig is an Australian artist, writer, philosopher and poet . His unique artistry and humour – which can vary from gentle contemplation to blistering satire – mean there are few Australians who do not have a Leunig among their possessions . The whimsical Mr.Curly , accompanied by his whimsical duck, offer a curly view of a curly world . Then from the security of a seaworthy ship officials shout at refugees huddled in an open, sinking boat . No humour in that . But this is part of what makes Leunig’s social commentary so effective .There is an expectation of humour . Instead Leunig deftly twists the knife . I am restricting myself in writing on nonsense to simplistic ants and frogs . Were I to venture into Monty Python and the Holy Grail and the Goons territory I would be treading on sacred ground . So I will restrict myself to the celebrated Charles ” Dodo ” Dodgson ~ Lewis Carroll – and a few others such as Roald Dahl . Charles ” Dodo ” Dodgson was a mathematics lecturer at Oxford – a studious, retiring unknown . He assigned the nickname Dodo to himself as he stuttered .Then an idyllic rowing boat trip on a sunny Oxford afternoon changed everything . ” Thus grew the tale of Wonderland .” In 1865 Alice In Wonderland was published . And in 1871 Through the Looking Glass . Carroll’s work would seem the very epitome of nonsense . Alice asked for a story with ” lots of nonsense in it . ” And the characters are surely among the most extraordinary, rich and diverse created – the time rattled rabbit , the mad cheshire cat and his equally mad acquaintances… In their simplest form they are absolute , utter nonsense . Yet Carroll was not only a particularly clever writer , he was a mathematician and a scholar with a vast wealth of knowledge to which was added a fine sense of irony and wit . Reading – and re-reading – Alice as an adult reveals a world of significant ideas hidden in the fantasy genre of a children’s book . Read it – and read it again . And supplement with present day analysis written about Carroll . The reading provides thought provoking perceptions . As an example : Alice In Quantumland : An Allegory Of Quantum Physics written by physicist Robert Gilmore has Alice exploring the “nonsensical ” world of quantum physics . The following may be taken as personal nonsense , but I wonder at Alice’s fall down an extremely large rabbit hole – down, down , down . What sort of world was the mathematician creating ? Alice , for the artist , offers an extraordinary cornucopia of images. For me, with due respect to John Tenniel – the first artist to illustrate the Alice books – the artist who most effectively captures the imagery and inanity of Alice is Salvador Dali . In 1969 Dali created an extraordinary series of lithographs – characteristically surreal , a style which evokes the complex and surreal Alice herself . And the unreal wotld Carroll created . Jabberwocky : ” ‘ Twas brillig and the slithy toves Did gyre and gimble in the wabe All mimsy were the borogroves And the mome raths outgrabe… ” Surely the ultimate in nonsense . And the lilting, rythmic , alliterative , extraordinarily creative mastery of the English language : .” Twas brillig… gyre and gimble.. snicker-snack ! ” ” O frabjous day ! ” What a wordfest ! Jabberwocky though is not all nonsensical nonsense . With ” eyes of flame ” and ” jaws that bite… ” it is monster made all the more frightening by the alien world Carroll’s wordplay creates . It is tempting to write at indeterminate length on the complexity of Carroll’s character . In addition to Alice… Carroll/Charles Dodgson was also the author of a Manual Of Euclid ” its main features (the) sequence and numbering of Propositions and… Parallels ” . In the context of the Manual though he manages to call into question the undue solemnity of scientific reasoning . ” Thinking it far better that the purchaser of this little book should read it… with a smile .” And who better than Dodgson to leaven the seriousness of science with a little necessary nonsense ? In writing on nonsense one could also be entirely serious . And follow a scholarly approach beginning with the work of the ancient Greek playright Aristophanes . And The Frogs – singing a chorus of nonsense verse . ” A shoal of little songsters… mere degraders of their art .” Dionysus says ” Search where you will, you’ll never find a true Creative genius… ” And Heracles replies ” I vow its ribald nonsense .” Shakespeare layers sense and nonsense – with a ” hey nonino .” (As You Like It .) And there are modern masters aplenty . I would like to conclude though with personal choices . Initial choices were Maurice Sendak and Roald Dahl . Sendak for his talent in entering the world of childhood and at the same time making meaningful nonsense of the adult world . When Where The Wild Things Are was published in 1963 , an American reviewer wrote that the book was entirely unsuitable for adults as it may well scare them . Dahl I have chosen for his unique ability to make something seemingly nonsensical carry a significant meaning . Maurice Sendak – wartime photo of his six year old cousin in Poland . There is ” rommytot ” aplenty in Dahl’s writing . ” A catasterous situation is very bad indeed, and a catasterous disastrophe is the the worst of all .” Dahl’s work, like Sendak’s could well have an underlying solemnity . His eight year old daughter daughter Olivia died of measles related encephalitis . And his first wife suffered a series of debilitating strokes . Yet Dahl’s genius somehow allowed him to turn these savage losses into a deeper understanding of childhood tribulations – and allow them to inhabit a courageous and wonderful, highly imaginative world . Matilda is not squashed by her appalling parents , but instead travels far and wide . ” She went to Africa with Ernest Hemingway and to India with Rudyatd Kipling …” Matilda says. ” Be outrageous . Make sure everything you do is so completely crazy it’s unbeleivable . ” Dahl’s courageous little character carries a timeless message for both children and adults . Dahl created a Phiz Wizzing collection of characters – Willy Wonka, Fantastic Mr Fox,, James and the Giant Peach , the BFG – forty five books in all .And each with its own unique characterers . And Dahl’s writing is enhanced by Quentin Blake’s artwork . And further enhanced both by the writer and the artist’s sense of nonsense . In conclusion I would like to quote the words of a student of Bryn Mawr College . From Serendip Studio – and with the kind authorisation of Ann Dixon – a definition of nonsense : ” Nonsense . It is the absence of logic … At the same time, nonsense is a challenge . It forces us to encompass a different mindset… Nonsense is a tool that can aid us in discerning our reality .”( Shayna 26/3/2010 ) Nonsense entertains and amuses, relaxing inherent defences . And arousing a search for sense iñ the nonsense . Presented with a perfectly coherent, logical, well structured academic proposition , we would seek to answer in a similarly coherent manner . But a generôus helping of nonsense allows us the freedom to explore and to question . Acknowledgements : Serendip Studio, Michael Leunig, John Olsen, Graphics AE: Adobe Photoshop, Typorama, @gpiczoo#PICZOO . Google search free images . TALL SHIP IN AN ALIEN SEA . This post is a collection of graphic images . The effect I was seeking was to take the majesty of a stately, tall ship and create a contrasting, alien and threatening environment . The image created shows an increasingly stormy sea and darkening sky .The ship is being pulled further and further into alien territory . An alien planet begins to appear in the sky . The crew have disappeared . The ship is pulled in by the force and power of the planet . The ship begins to break up . The wreckage of the ship is pulled closer and closer to the alien planet . Prehistoric birds begin to appear . Finally the wreckage of the ship sinks below the water and is lost forever . Only remnants of the tall ship are left. And a prehistoric bird . Fantasy – or reality ? Acknowledgements : Graphics AE . Apps : #BrainFeverApps_ FFA , Juxtaposer , InstaSize, Google search free images . Phidias – the Golden Mean. Mandelbrot – mathematician and the geometry of fractals . The Artist – to the artist a gift of infinite complexity and beauty . This is in no way a learned mathematical treatise , nor a treatise on art and architecture . Rather it is an attempt by the writer and artist to understand the history and discovery of fractals – their complexity and their beauty . And the extraordinary gift of the mathematician to the artist . To the mathematician whose learning I may offend , my apologies . And to those who have made an academic study of art and architecture a similar apology . For anyone just interested in the beauty of fractals – but find the concept hard to understand – if I have added to their insight and understanding , then I have achieved what I had hoped . The Golden Mean or Golden Ratio . The Golden Ratio has unique mathematical properties and is defined by the ancient Greek letter Phi . It was used by the Greek sculptor and mathematician Phidias to determine the ratios in his sculptures . In the simplest of mathematical terms it describes a numerical ratio. Mathematically the definition is more complex, but for the purpose of this post, it can be described as a ratio of harmony , of equilibrium . The Fibonacci Sequence has been described as ” nature’s numbering system ” . The wonderful whorls and spirals at the centre of a sunflower are the result of constant numerical repetition . All of the above suggest order and regularity . But in the early 20th. , a Lithuanian mathematician , Benoit Mandelbrot ( b.1924 ) , found in the harmonious repetitions of patterns and ratios , irregularities .. Mandelbrot used the term fractal to describe these irregularities – the word is derived from the Latin ” fractus ” , to break . Mandelbrot , known as the father of fractal geometry used the term to ” describe objects and surfaces which are irregular at various dimension of scale .” The particular fractal, named after him, was called the Mandelbrot set . Fortuitously, Mandelbrot’s work was concurrent with the development of computers and their ” number crunching ” capabilities . What began to emerge were images ofextraordinary beauty . In pragmatic terms Mandelbrot’s work had application to many of the sciences . And for the artist opened an extraordinary vista of creative exploration . Fractal Art is popularly defined as a genre belonging to the 20th Century and the age of computers . There are fractal images throughout history – but it is only through Mandelbrot that their complex mathematical structure is seen for the first time . Mathematics : The following images are to show the beauty of mathematics that surrounds us every day . To these images will then be added images of fractal art – the dimension they add to the artist’s palette . 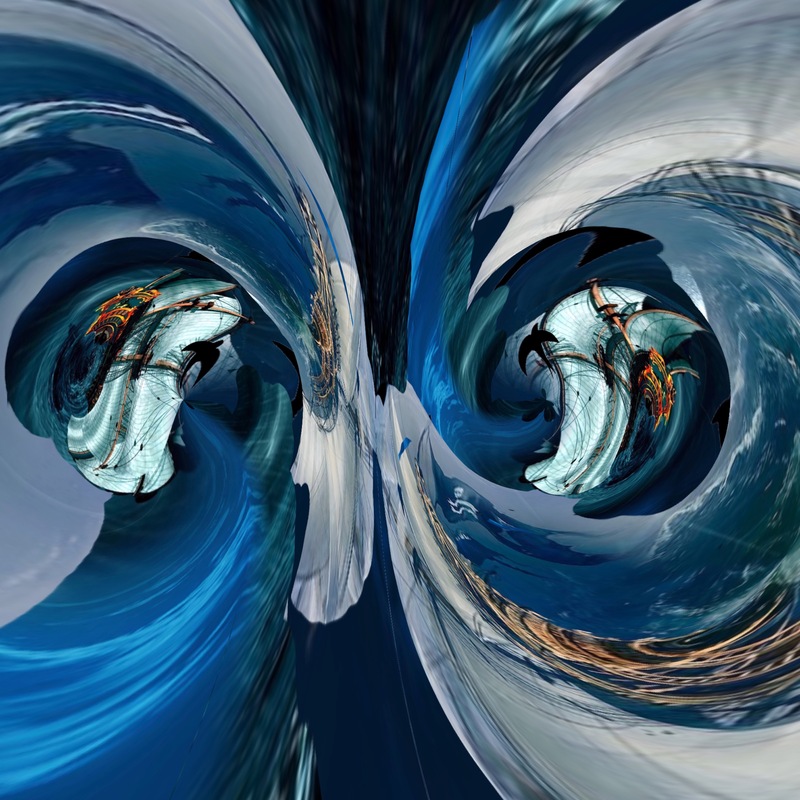 Fractal Art : These images have been designed by me – the first image derives from the fractal , the second derives from the Latin fractus – to break .